Den populære og langtslående Tony Finau blir Ping-spiller i flere år. Han har vist seg som en meget god spiller den siste tiden. I forrige uke rykket han opp fra 44. til 37. plass på verdensrankingen. Det siste året har han hatt 10 topp 10-plasseringer. sist uke ble han nr 6. 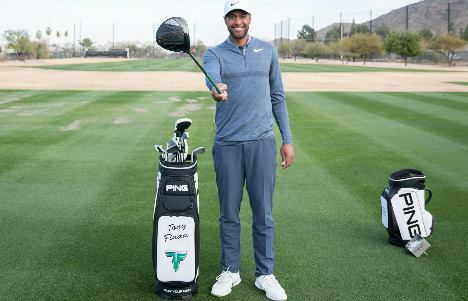 PHOENIX (Jan. 30, 2018) – Tony Finau, a PGA Tour winner and one of the longest hitters on tour, has signed a multi-year agreement to represent PING, company President John K. Solheim announced today. The 28-year-old Salt Lake City native led the just-completed Farmers Insurance Open with an average drive of 325.6 yards and is second on tour in average driving distance at 328.8 yards. He switched to the new PING G400 Max driver at this season’s Sony Open. He will make his debut as a PING Pro at this week’s Waste Management Phoenix Open. At 6' 4" and 200 pounds, Finau was a premier high school athlete in several sports, most notably basketball. But golf was his first passion, and he turned pro out of high school at age 17. He earned his PGA Tour card for the 2015 season with a win on the Web.com Tour in 2014. In 2016, he won the Puerto Rico Open on the PGA Tour. As part of a multi-year agreement, Finau will carry a PING staff bag and play a minimum of 11 PING clubs. Financial terms and the length of the agreement were not disclosed.